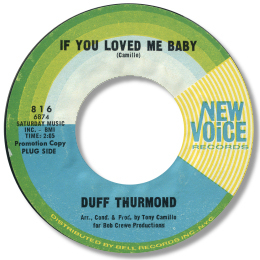 I’m only aware of this one disc by the intriguingly named Duff Thurmond but it really is one to look out for – excellent New York soul. If You Loved Me Baby is a well structured slow uptown beat ballad with Thurmond giving vent to his frustrations with some great falsetto shrieks, backed up by a female chorus, lots of percussion and a full horn section. The flip is a fine R & B styled beat piece. I much prefer producer Tony Camillo’s work from the 60s to his disco fodder from the next decade. Anybody who likes this one should check out the fine Kenny Wells 45 on the same label here.